Introduce this casual space saver loveseat chaise into your home for perfect comfort and plush style. A fully padded chaise gives you support from the neck all the way down to your toes, with plush pillow arms to ensure your whole body feels relaxed. 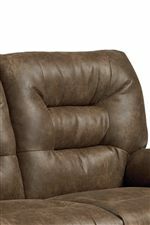 Channel tufting on the seat back emphasizes the generous padding used throughout the piece, while also adding a classic detail. 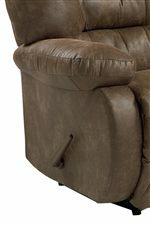 Designed to help you take advantage of all the space in your living room, this recliner even functions against a wall, so you can save space and still get in a relaxing nap. Comfortable and functional, the space saver loveseat chaise is the perfect addition to your casual lounge area. Available in manual and power recline. The Maddox Space Saver Loveseat Chaise with Pillow Arms by Best Home Furnishings at Best Home Furnishings in the St. Louis, Chesterfield, St. Charles, MO & Waterloo, Belleville, Edwardsville, IL area. Product availability may vary. Contact us for the most current availability on this product.